The main shop offers 2000 (to 3000) square feet of space flooded with beautiful north light from a wall of full height windows. 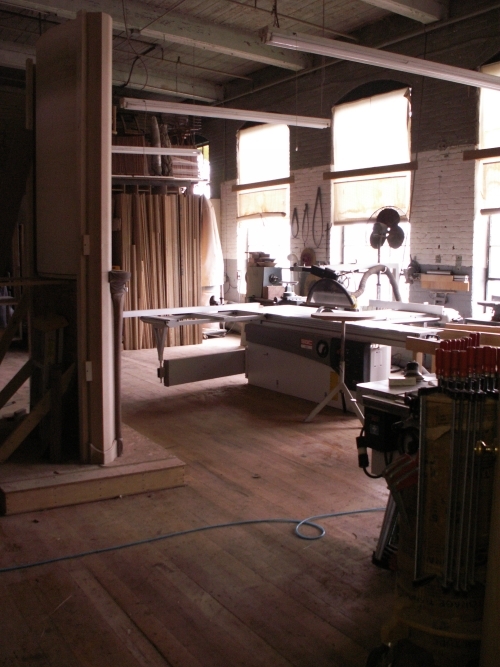 The large space is efficiently outfitted with the tooling and equipment necessary to produce everything from large-scale cabinetry projects to works with detailed marquetry and carving. 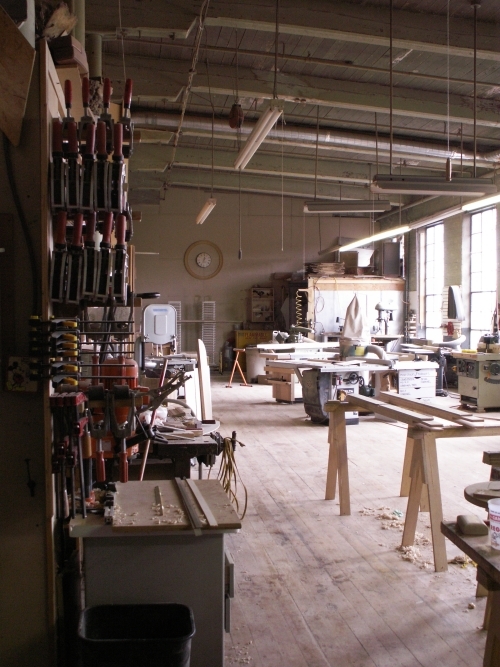 With careful acquisition of tooling, much of it at auction and over the span of more than two decades, the shop at Piper Woodworking stands as likely the best-equipped small shop in New England. The subshop houses the sliding panel saw, one of the few tools that is of relatively recent manufacture. 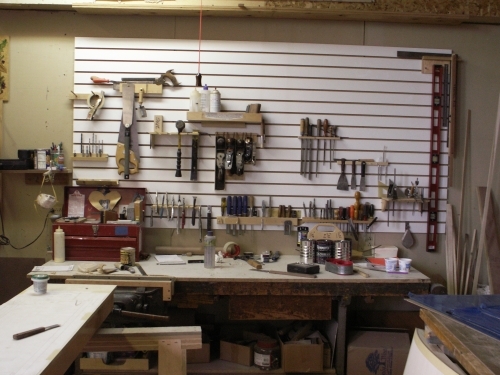 Many of the other tools have been acquired at auction and some of the best performing are near a century old. This Oliver Lathe is an example of one of Kurt’s prized antique tools. 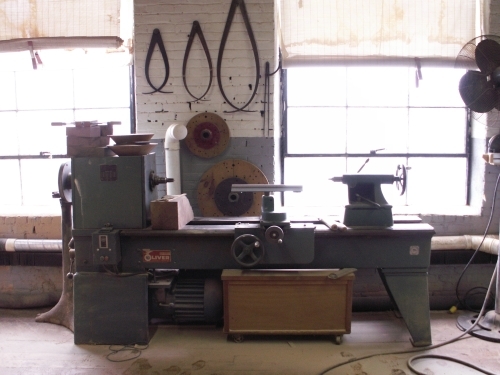 A massive lathe, capable of turning material up to 30” in diameter, this machine works flawlessly and expands the capacity of the shop well beyond that normally expected, short of a shop dedicated to the needs of an accomplished wood turner. 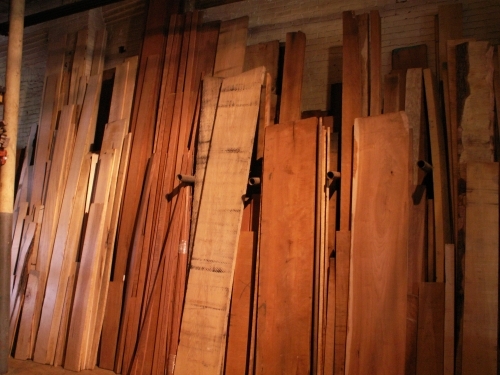 The lumber storage area, a separate climate-controlled area, houses some truly extraordinary examples of a wide range of species. Kurt has been acquiring material he believes to be of particular note for over two decades. This rack includes some simply wonderful, book-matched slabs of walnut, cherry, curly maple, birdseye maple and other common and exotic species. 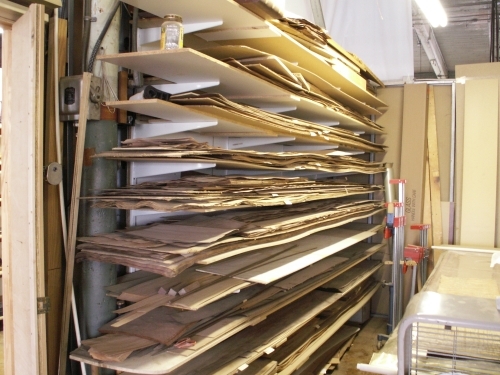 Veneer storage is accomplished in an orderly manner as illustrated here in one of the racks where inventory is housed. Individual species, segregated by grain pattern if appropriate, are tagged, stacked and laid on shelving designed to support extended lengths. 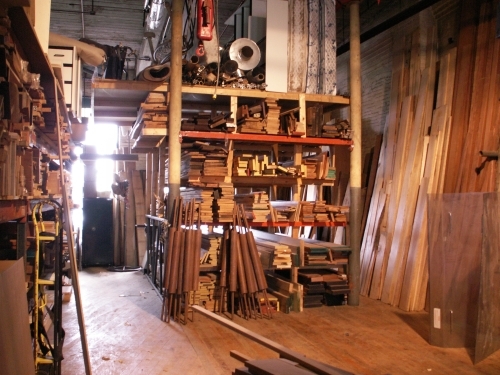 In addition to the material seen here, several years ago Kurt purchased the inventory of a retiring marquetarian, who in turn had purchased the inventory of the gentleman from whom he received his marquetry training. As a result, he now has an inventory of veneers, some of which are unavailable at present from any source.